Are you thinking about writing an ebook as a lead magnet for your business? Done right, ebooks can help you attract new customers by giving them really useful information. In this guide, we’ll share the most common ebook mistakes, so you can avoid wasting your time. As a business owner, one of the main reasons you’re going to write an ebook is to give it away for free to help build your email list. A free ebook is a highly effective lead magnet to generate website traffic and attract new subscribers, especially if it solves a common problem. Here’s an example: Lots of people want to learn how to write better headlines. Google “headline hacks” and you’ll find a free ebook from Smart Blogger at the top of the list. You’d better believe that attracts traffic! An ebook is also a great way to repackage the content you’ve already got on your blog to bring it to a new audience. And writing an ebook can also show off your expertise to customers without a hard sell. If you want your ebook to generate leads, you need to plan carefully to meet that goal. Here are some typical planning mistakes when writing your first ebook. Sure, you know you want to write an ebook, but what’s its real goal? What issue are you trying to help your customers with? You have to figure this out before you even start planning your ebook, otherwise no one will be willing to trade their email address in exchange for it. See what your current customers are searching for on your site. Ask the customer service team about the questions people are always asking. Pay attention to what your social media followers ask you. Those three sources alone will give you a shortlist of potential ebook topics that will be really useful. 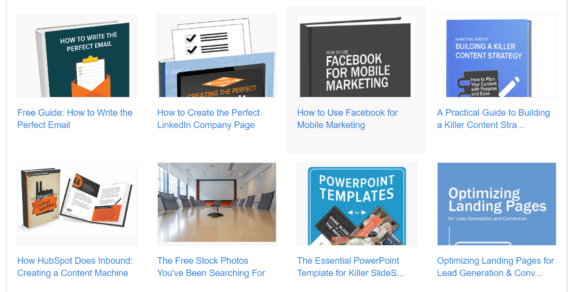 Hubspot really nails their lead magnet ebook strategy by providing ebooks on specific topics their audience wants to learn about. Because of that, lots of people trust them to provide reliable, trustworthy information and check their site first when looking for help in that niche. Generating ideas is just the first step in figuring out the best topic to write your ebook about. The next step is to figure out if the people you’re writing for are really interested in those ideas. Newsflash: just because YOU think there’s information your market needs, that doesn’t mean they think so too. To avoid creating an ebook that your audience ignores, you must validate your idea. Send it to your email list, asking people to indicate a preference. Create a poll on Twitter or Facebook and have people vote for their favorite. Run an optin form split test with two different titles and let the data tell you which one works. Once you complete your analysis, you should have a winning ebook idea. There’s no point in writing an ebook that’s identical to those already on offer to your target market. That’s why it makes sense to know which free ebooks your competitors are offering as their lead magnets. The easiest way to do this is to sign up for their email lists so you can make sure the ebook you write has something different to offer. If you don’t have an outline, you don’t know where you’re going. Keep in mind the big question you want to answer for your readers. Write down the main points you need to answer that question. Put those in an order that makes sense. Add sub points for each main point. If you need to do additional research, this is a good time to make a note of supporting stats. When you’re done, read through the outline one more time to make sure it makes sense. If it does, this will be a good guide when you start writing. Don’t worry too much about the introduction at this stage. Until recently, PDF ebooks were one of the best ways to create an ebook that looked the same no matter how people were reading it. They’re still a good way to create an ebook quickly, but reading behavior is changing. Today, PDFs won’t work for everybody. More people are reading ebooks on their cellphones. On those devices, PDFs can be hard to manipulate. And if you’re using a standard e-reader, they don’t look that great either. That’s why it makes sense to publish your ebook in a format that works well for your readers. Both e-reader formats allow text to be resized and reflow so it looks right on any screen. Then go to Audience » User Explorer » Mobile » Devices to see the specific mobile devices people use. You can use this info to choose the ebook format that works for most of them. Another option is to have multiple formats available. 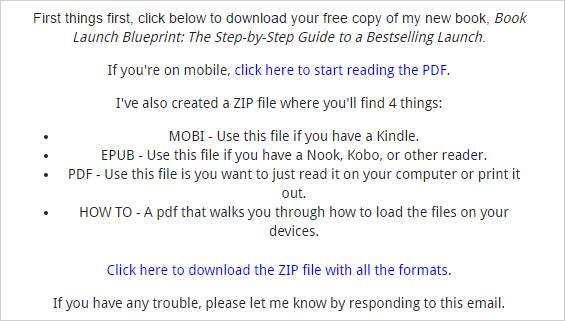 For example, the Book Launch Blueprint lets readers choose the ebook format that works for them. One essential ebook writing task is allocating time to actually do the writing. If you don’t commit to the project, you may never finish it. To solve this, work out how much time you have available for writing each day or each week, and use that information to set a deadline for finishing the first draft. Then block out writing time on your calendar and commit to your ebook project. We get it. Sometimes it seems hard to get a whole ebook done, when you could wow your customers with a quick checklist or template instead. But, as we’ve said on our blog before, a benefit-driven ebook can be a great lead magnet, so don’t give up. If you’re thinking that once the plan is in place, it’s time to start writing your ebook, you’re almost right. Sure, you can start writing, but what’s crucial at this stage is to get your ebook marketing strategies in place. Here are some ebook marketing mistakes some people make. Sometimes you can get so caught up in producing the ebook that you forget you need to tell people about it. That’s what happened to Hector Cuevas of Hectorpreneur. As a result, he had to delay his book launch till he managed to prepare some marketing material. If you’re marketing anything, you should start building your email list immediately. People still read emails and they deliver an excellent conversion rate, so don’t ignore the potential for spreading the word about your ebook. As we mentioned earlier, setting up an email list specifically for your ebook can help you decide whether it’s a valid idea. Once you have the green light, it’s a good way to start building up a relationship with the community you want to reach. Build a high-converting optin form. Leverage OptinMonster success themes to confirm their subscription and deliver your ebook. Also send your ebook via email to ensure lead magnet delivery. The analytics and email marketing data you collect from your optin form will also help you to understand your target market even more. SEO is a critical part of your business model, says Unbounce, especially for lead generation. Pay attention to optin form and promotional copy, headlines and content keywords, as well as page speed and design. Better SEO equals better search position, putting your ebook promotional page on the road to better conversions. Consumers trust other people’s opinions more than your marketing. If you don’t include social proof like testimonials, reviews or even download numbers in your marketing, your ebook will be less successful. How do you get social proof when you’re writing your first ebook? One way is to give a few people advance copies and ask for reviews or testimonials in return. Then feature those in any promotional copy. If you have other stats that make you look good, use those as social proof, like Hiten Shah does for his Content Marketing Playbook. Your ebook title is your best chance to make a good first impression and encourage leads to join your list. As the saying goes, you don’t get a second chance to make a first impression, so it’s important to get it right first time. You can use one of these 26 tools to help you create better headlines to come up with some ebook title choices. Then you can narrow it down by asking your subscribers and split testing title variations on your optin forms, as mentioned above. When you’re marketing your ebook, there are two important parts of your your ebook promotion. (Well, they’re all important, but you really have to nail these two). The second is the call to action (CTA) which tells them what to do to get this benefit. A call to action is the text or image that prompts the people seeing it to take action. You can split test your landing page to see which hook and CTA are most effective for your ebook. What if you’ve found the right topic for your audience, but you don’t have the chops to write it? Then don’t. You’re never going to win subscribers if your ebook doesn’t show off your expertise. You might even take a hit to your reputation. When you’re choosing your topic (see ebook mistake #1), pick something you know about. Otherwise, consider hiring an expert to ghostwrite your ebook for you. That way you get a great lead magnet to meets your customers’ needs, but don’t have to do the writing yourself. There’s a lot of competition for your audience out there, so thin ebook content just won’t cut it. What do we mean by thin? Content that seems unoriginal or that doesn’t deliver on the promise of the title and hook. Good ebook content will wow readers and make them eager to share the resource with others. THAT’s how your ebook becomes a successful lead magnet. To avoid thin content, check to make sure your ebook answers the questions and provides the solutions readers hope to get. Otherwise, it’s time to go back to the drawing board. Of course, there’s also the opposite problem, too. Some people try to solve every customer problem in the history of the universe with a single ebook. If you’re using an ebook to win customers, you need to walk the fine line of solving one issue for them, while still leaving them wanting more. Take a leaf out of Hubspot’s book. They have a series of short ebooks covering multiple issues their customers need help with. Hubspot’s inbound marketing strategy brings in 75% of its leads, so it’s definitely a strategy to copy. As we hinted in mistake #4, don’t write the introduction too early. Sure, it’s the first part of the book, but it’s not the first part you write. The reason? The introduction summarizes or teases what’s coming up in the book. It’s hard to know what to highlight if you haven’t finished writing! Books usually evolve away from your original idea, anyway, so it’s smart to avoid having to write the intro twice. Take it from us, one thing that’s guaranteed to delay your ebook writing process is trying to write it and edit it at the same time. It’s tempting to fix the little typos and errors that creep in as you write, but experience shows that gets in the way of actually finishing the ebook. Write first, edit later: it’s a motto many writers live by. That said, you can make the editing process smoother if you try to write your ebook the right way first time round. Avoid over-long sentences, complex words and phrases, jargon and anything that stops readers from understanding your ebook. 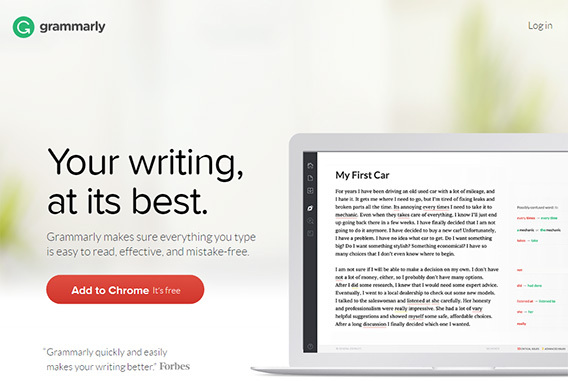 If you’re not sure about the quality of your writing, you can test it for readability using a tool like Grammarly. Writing an ebook is definitely not a case of “one and done.” Even expert writers go through a couple of rounds of writing in the content creation process. Even with a robust outline, you’ll find things you need to change to make your message clearer or to answer new questions that come up. And if there are lots of people who have to approve your ebook, the process will take even longer. Fleshing out the ebook outline (see mistake #4) and getting advance feedback from everyone in the approvals chain is one way to make the process smoother, but expect to do more than one draft before the ebook’s done. When you write the ebook, don’t waste the opportunity to promote some of your other relevant content or to give readers the chance to connect with you elsewhere. 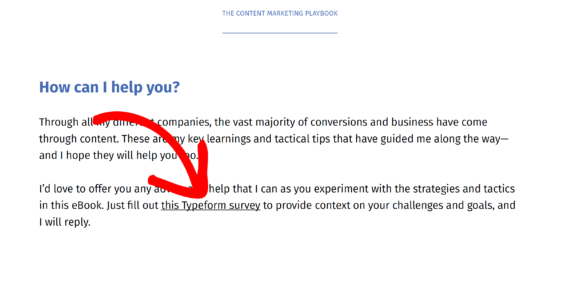 For example, Hiten Shah’s Content Marketing Playbook has a link to a survey on the last page. That will help him to learn more about his readers’ interests so he can target future content to them. If your ebook isn’t a PDF (see mistake #5), then you can use Bit.ly or your favorite URL shortener to create a memorable short link to a piece of pillar content. It’s crucial to make sure you have a backup solution installed before starting the writing process. There’s nothing worse than getting to the end of an ebook project and discovering you have lost the final version of your work. Try using a cloud backup solution that backs up automatically so you never have to worry about it. Backup, backup, backup – we can’t emphasize this too much! When writing your first ebook, it’s easy to convince yourself you don’t need an editor or proofreader, but that’s not true. After you’ve worked on the project for a while, you’ll be too close to it to know whether it really works for your target audience. If you want to be sure you’re delivering the message you want, and delivering it clearly, you need an editor. In many companies, the editor and proofreader are the same person, but proofreading is still important. An editor checks your ebook for structure and content. A proofreader makes the final check for mistakes so you end up with a professional-looking ebook. You’d typically proofread your ebook after it’s been designed just in case there are errors when laying out the text. It’s a good idea to check graphics with text overlays, too. If you’re running your business alone, and need help with proofreading, you can ask the people on your email list. Some of them would love to get an early look at your ebook in return for giving feedback. While the content will keep people reading your ebook, the cover will help them decide whether to download it. As Smart Blogger says, a DIY cover design approach could seriously hurt your rep. Making sure the cover is the right size (if you’re doing a Kindle version, the specs will be different) is just the first step. You also need to choose images that reinforce your message, are crisp and sharp, and most importantly, that you’re allowed to use. If you’re on a budget, you can find great images on Unsplash, Pexels and Pixabay. If you have a budget for quality images, then iStockPhoto is a good place to start to find a beautiful ebook cover image or some vectors and illustrations you can use to create your own. Let’s face it; there’s no rule that says a business ebook has to look boring. Get your ebook cover right, and it will attract even more leads. Finally, when you write your first ebook, it’s easy to get caught up in making it perfect. Yes, you want it to be excellent, but if you’re nitpicking over tiny things it’s time to show your baby to the world. Don’t worry; since it’s a digital product, it’s pretty easy to fix a mistake if you spot it later. So move beyond perfectionism and make the ebook available so it can start generating leads for you. You now know the key mistakes to avoid when writing an ebook so you can get yours right the first time. When you’re ready to use your new ebook as a lead magnet, make sure you’re not making these optin design mistakes that even the pros make. For more free guides to effectively building your email list, be sure to follow us on Twitter and Facebook. Thank you for sharing. I was directed to your page thru a blog about marketing as I am currently seeking employment in that field. I understand free ebooks are a way to introduce yourself and gain clients interest. Your info to download Grammarly was excellent. I have no prior experience in this field if you have any advice to help me with my second interview. Am I correct in assuming the ebook should be related to the product or company you are marketing?